Located in a prestigious office park in the heart of Warsaw, this modern business centre offers bright, spacious and airy offices for professionals and entrepreneurs. The location provides tenants with not only prestigious and modern office solutions but also a dynamic environment with surrounding green areas. In the immediate vicinity you will find various amenities including convenient cafes and prestigious restaurants. Only 300 metres from the central railway station this unique, modern high-rise building is in the heart of Warsaw's city centre. Right next to the Rondo ONZ metro station it is ideal for commuters while showers and bicycle racks are also available. The flexible office space is complemented by a modern canteen, event zone and fitness center. The surrounding area also offers lots of restaurants and cafes. Centrally located in Warsaw, this centre offers a selection of fully furnished offices which can be amended to meet needs of companies and entrepreneurs. These modern offices are equipped with advanced technology, high speed internet connection, meeting rooms furnished to a high standard and benefit from professional reception services and support staff. The centre is surrounded by leading companies, luxurious hotels and restaurants and is close to the main railway station. This modern serviced office centre sits high up in one of Warsaw's most prestigious buildings, on the city's principle thoroughfare. With such an impressive exterior, your company is sure to leave a lasting impression on visiting clients and executives. Offering a range of comfortable, light offices with large windows and state-of-the-art IT infrastructure, this centre sets the benchmark within the city’s fast-growing economy, which includes a concentration of electronics and high-tech industries. This stunning business space found in the city of Warsaw, is away from the hustle and bustle of the city centre but close enough for ease of access for your commute. Offering a range of bespoke packages, you can benefit from private offices or coworking spaces, with access to meeting rooms. An onsite community manager is available to ensure your day runs smoothly, and the building boasts a range of communal areas. A centre that would suit both start up companies and experienced corporations. It offers a wide range of offices that come in a variety of different sizes and can be personalised to boost the portfolio of the business. 24 hour security is available with CCTV and intercom systems. Meeting rooms can be booked by the hour and well trained staff are there to ensure that the day to day running of the centre goes smoothly. High speed internet and day to day cleaning of the office are all supplied too. Situated in one of the most business friendly parts of Warsaw , the centre offers great versatility for business networking with numerous companies being close by. There are several bars and restaurants in the proximity all offering a good social life. Nearby is Centrum (Metro), a short five minute walk and the airport is only a thirty minute drive. 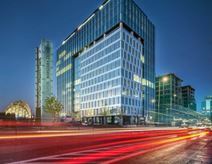 A selection of office spaces is available to let in a prestigious area of Warsaw. These elegant offices are provided with a wide range of services and facilities and offer a very professional environment, ideal for any successful business. This turnkey solution also comes with parking on-site, making commutes to work as simple as possible! Close to the city centre, they benefit from excellent public transport links and are surrounded by numerous companies, shops and hotels. This centre is located on Chlodna and Towarowa streets, close to the city centre. The business centre offers impressive office space with amazing views of Warsaw. A full range of facilities and services is available. This centre is advantageous for companies with international clients or contacts across different time zones as it is also accessible 24/7. There are videoconferencing facilities and shared internet throughout the site to ensure your business remains well connected. Within walking distance, there are hotels, events spaces, museums and many public amenities. This is a new business center offering comfortable serviced offices in a variety of sizes. These are fully furnished spaces, with a range of support services available to tenants.You can also benefit from this centre's 24 hour access and security, allowing you to work late hours. On top of a comfortable and inspiring working atmosphere, you can enjoy a superb location, close to the central railway station, many restaurants, museums and a shopping centre! There are several hotels at which you can accommodate your visiting clients. This centre benefits from an abundance of services and amenities which will enhance the efficiency and comfort of your workspace environment. Here, you can enjoy high-speed internet, copy and printing facilities and security systems. Close by, there are many amenities to enjoy and explore outside of work, such as restaurants, cafes and fitness centres. There are many hotels in walking distance so your visiting clients can have easy access to the centre. 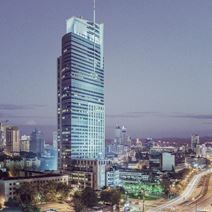 This is a unique opportunity to rent office spaces in a modern and stylish building strategically located in Warsaw's business district. The building offers offices and meeting rooms elegantly furnished and equipped with state-of-the-art technology, spacious lounge areas and is supported by professional, multilingual and friendly staff to assist your business in all administrative tasks. Surrounded by renowned hotels and restaurants, this building is easily accessible from the city centre and well connected to the airport. Modern centre providing a range of furnished offices available on flexible terms at affordable prices. This centre provides high-speed internet, spacious meeting rooms, business lounge access and a welcoming reception area. Work-spaces here benefit from plenty of natural light as well. In addition, this centre is well situated close to numerous transport links, providing convenient travel around the city. Local amenities can also be found in abundance in the immediate vicinity. A modern centre that offers its clients a luxurious working experience. Fitted with state of the art lighting, furniture and supported by well trained expert staff, this is a work space that offers you the chance to maximise productivity and is a fine centre to introduce to clients. Fast internet, 24 hour security and network events are all provided as well as co working options, meeting rooms and the option to have flexible contracts. The centre is close to major train stations and can easily be accessed by public transport. It is within a thirty minute drive from major roads and an hour away from the airport. It is also close to a number of bars and restaurants. This brand new coworking hub offers a range of open and spacious work spaces, designed to boost your productivity and community feeling. Offices come fully equipped and furnished with all you need to get to work as soon as you move in. The building also offers day care services for your convenience and disabled facilities. You can enjoy refreshments throughout the day from the on-site coffee bar. With easy access to public transport you can stay well connected to the rest of the city. Offering modern and contemporary offices in a great location of Warsaw, this business space is located right beside the main train station, allowing for easy accessibility. If you wish to drive to work, parking facilities are found on-site or nearby. You will also have access to 2 kitchens with refreshments and 3 conferencing rooms holding up to 120 people. A restaurant and cafe are found on-site for your convenience and plenty of local amenities are in the area. This modern and spacious building offers over 1600 sqm of flexible working space spread across four floors. Offices are fully equipped and furnished, with individual heating and air conditioning. You can access the working space 24/7 with security around the clock. Additional features include printing facilities, receptionist services and access to meeting rooms. The building is easily accessible with great transport links. Found away from the busy city centre, this business centre is located in a prime spot right beside a main train station and with plenty of bus services passing through the neighbourhood frequently. The centre offers a range of bespoke membership packages, allowing you to work as flexibly as you want. Offices are beautifully designed and fully furnished, with access to meeting rooms and communal areas such as the kitchen with complimentary refreshments. This centre is located in an elegant and contemporary office complex in the heart of the financial district of Warsaw - Mokotów. The site is composed of two seven-storey buildings, complete with fully furnished, luxury interiors and an extensive range of state-of-the-art facilities and technical equipment. Tenants will have at their disposal 220 underground parking places as well as bicycle stands and cloakrooms for bicycle users. You will find a social and vibrant work atmosphere in this centre. Innovation and interaction are encouraged through lectures, workshops, special events and weekly happy hours, and networking is promoted with the top people and companies in the local tech & innovation scene. This designed shared office space of entrepreneurship and innovation is located in the heart of Warsaw, at the very centrally located Hala Koszyki. Offering a range of modern and contemporary offices, this convenient business address is located in a great neighbourhood by Warsaw Old Town. Offices come full furnished and ready to use, with state of the art IT infrastructure and 24 hour access. The terms and memberships are flexible and affordable, giving you all the agility your business needs. The centre is easily accessed by public transport links and plenty of local amenities can be found nearby. 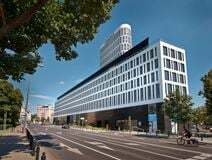 This brand new business centre is opening soon in the financial and cultural cub of Warsaw. Here you will benefit from a variety of facilities offered by the centre, including dog-friendly offices, outdoor communal spaces, an arcade room and brainstorming room. Offices come beautifully furnished and decorated, with conference rooms that are fully equipped and ready to use. There are excellent printing/copying facilities, as well as free beverages and a daily cleaning service. Join a like-minded community of entrepreneurs to make the most of networking, developing and growing your business. This centre provides a range of furnished offices available on flexible terms. All work-spaces benefit from plenty of natural light throughout the day, as well as super fast WiFi and spacious meeting rooms. The area is also well connected via public transport, with an in-house underground station featured within the office building. Local amenities surround the area as well, with great opportunities for visiting restaurants, bars and retail outlets. This Class-A office building provides spacious and fully equipped office suites in an area popular with international companies, consultancies and financial institutions. The site offers 24-hour access and security, administrative and technological support, secure parking, on-site management, a professional reception area, videoconferencing capabilities and even an internal fitness centre available for client use. There are also great transport links available. This business centre offers fully furnished office spaces, sophisticatedly decorated and modernly designed. The offices are equipped with advanced technology systems, air-conditioning, high speed internet connection and are provided with all the services and facilities needed to run a successful business. These offices benefits from professional reception services and efficient and highly skilled staff to support your business in all the administrative tasks, including answering calls service, translating and booking services, meeting and greeting clients, catering services. Strategically located in a dynamic and fast growing business district, this centre is surrounded by leading companies and numerous amenities and is excellently served by public transport. Offering a great selection of modern office solutions, this refurbished building is found in the heart of Warsaw. The building boasts a spacious reception lobby, with a sleek and boutique character of the building which is bound to impress your guests. The building provides 24/7 security and access to communal areas. In the immediate vicinity you will find a good range of local amenities including eateries. The business centre is in the heart of the city meaning getting around and using day-to-day amenities. Everyday you can also admire the magnificent skyline of the capital, which stretches from the windows of the last floors of the office building. Whether you're looking for a private office or a co-working space there is something to suit you! Make use of the unique creative laboratory filled with pillows and hammocks. This convenient business address in the heart of Warsaw offers a range of workspaces including private offices and coworking areas. Terms are flexible and with affordable rates your business can have all the agility it needs. An all-inclusive fee ensures you're not caught out by hidden fees at the end of each month, with your membership fee including access to high speed internet, beverages, printing facilities and much more. This workspace solution is perfect for forward-thinking companies looking to flourish in an inspiring yet comfortable work environment. This centre provides 24-hour access and security, high-speed Wi-Fi, administrative support, mail handling services and a secretarial team to greet and manage your clients for you. Here, there are cutting-edge facilities that will enable your business to thrive in a dynamic area that offers lots of cafes, restaurants, hotels and a number of public transport connections. The space is accessible 24 hours a day so is well suited for any kind of business hours. Offices come fully furnished and you can also make use of the on-site fully equipped meeting room. You'll find the nearest tram stop only two-minutes away from the from the business centre and the main line train station is 10-minutes on foot from the building. You can find many places within walking distance to keep you entertained. Located nearby the Warsaw airport, this business centre is conveniently located with plenty of local amenities and public transport links. The centre offers a range of flexible workspaces, offering multiple bespoke packages giving you affordable options. Offices are beautifully designed, modern and comfortable, letting you work at your best. The centre also provides high speed internet, meeting room access, cleaning service and an onsite community manager. 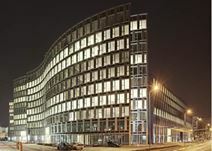 This 10-floor premium business centre is situated in Warsaws Wola district and provides extensive office space as well as underground parking to a variety of businesses. It has a polished, modern exterior and excellent links to the metro, as well as being within easy driving distance of the city centre. The interior is as modern as the exterior, with fully furnished offices providing a great professional space to work. This is a highly sought-after location. Being located in the city means you have quick access to public transport and the many day-to-day amenities within walking distance. The space is accessible 24/7, with many features in 3000m² of workspace that will inspire you to work and develop, with the choice of co-working, dedicated desks and private offices. Within walking distance, there are many local cafes, bars and restaurants at which you can entertain and impress clients. Created by the renowned and award-winning architectural studio of APA Kurylowicz & Associate this business centre has a strategic location of the Plac Unii between Pulawska, Warynskiego, and Boya-Zelenskiego streets, just five minutes from the centre of Warsaw and 10 from the central train station. From serviced offices to conference rooms the modern complex provides up-to-date business solutions. Located in the core of the Central Business District and surrounded by blue-chip companies, members of the Fortune500 and biggest global corporations, this flagship location is ready to move in to and provides modern, sleek space for companies of all size. 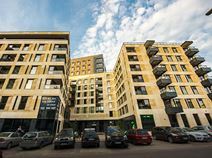 The building is less than a 10-minute walk from Warsaw Central Railway Station, connecting you to the rest of the city and wider areas using public transport. Strategically located in the business district of Warsaw, this centre offers offices and conference rooms of various sizes which can be amended to suit the needs of companies and entrepreneurs. These modern and spacious office spaces are fully furnished to a high standard, equipped with the latest technology, high-speed internet connection, professional reception service and a variety of facilities to help you run a successful business. 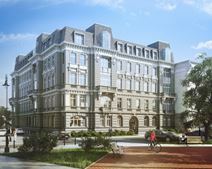 Next to the Charles de Gaulle roundabout along the famous street of Nowy Swiat in central Warsaw, this business centre provides a range of flexible office space in a prestigious area in an elegant and renovated building. Your business can also benefit from this space's on-site IT support for its shared internet provided, so that your company can stay well connected and running efficiently throughout its occupancy. The area is wonderfully green, with lots of well maintained spaces in which to relax during lunch breaks. You may find this modern, eco-friendly building hard to leave with its VIP club and terrace, and a mini golf course on the roof. In this work space you have the option to customise your office with furniture, layout and decorations, tailored to suit your needs. Choose whether to rent offices, rent a desk or book a conference centre in this new mixed-use complex in the heart of the capital city. 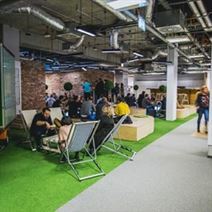 This centre is located in central Warsaw which is a hotspot for growing businesses and this space gives you a foothold in one of the most sought-after neighbourhoods, Solec. 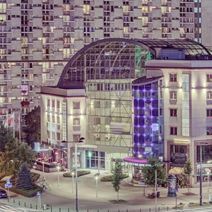 This centre is located in a prime and much sought-after area of Warsaw due to the excellent range of local services, great transport networks and the leisure pursuits found in close proximity. Fully equipped with high-end amenities and exceptional networking opportunities with local businesses in the area, the centre is a fantastic prospect for corporate operations. The site features high speed internet, attractive conference facilities, on-site management. You can also benefit from 24-hour access and flexible occupancy terms for your convenience. The perfect location in which to accommodate and entertain clients within a fantastic atmosphere. The space is in the centre of Warsaw, with many facilities within 5 minutes walking distance - including banks, hotels, restaurants, shops, cinemas and theatres. There are meeting rooms and furnished modern offices all included in the centre's pricing, so you can set up your workspace with no hidden costs. Offering modern office spaces in the stunning Spektrum Tower in the heart of Warsaw, this business space is ideal for professionals looking for a comfortable and highly functional place to work. There are plenty of public transport links right on your doorstep, allowing you to easily access the centre and the rest of the city. Amenities include exclusive on-site restaurants and cafes and a gym on the ground floor. This impressive centre consists of offices furnished to a high standard, lounge area, secure parking facilities, support services a full list of amenities support your business. It is accessible 24/7 for your convenience. Set in one of the most eminent business areas of Warsaw, this building is close to the city centre and benefits from excellent transport connections. Close by, there are restaurants, hotels, banks and parks. These elegant offices are located in the heart of Warsaw, a prestigious area excellently served, ideal for dynamic businesses. These offices are close to the main railway station and benefits from parking and gym facilities. This centre is accessible 24/7, with complementary beverages, IT/administrative support, secretarial team and videoconferencing facilities. Here, there is a gym and secure underground parking. Near by, there are lots of shops, museums, theatres and a cinema. Within walking distance, there is a great selection of restaurants and cafes to visit on your breaks! This is a unique work space opportunity within a landmark building in Warsaw. Designed by a famous architect, this building is sophisticated; decorated with great attention to details and equipped with state-of-the-art technology which will definitely enhance the image of your company. With conference facilities, meeting rooms and IT support, you can convene collaborative projects easily. This space is accessible 24/7 for maximum flexibility! Modern offices are available to let in the heart of Warsaw, surrounded by luxurious hotels, a variety of shops and major amenities. The building offers a wide range of facilities, including secure parking facilities, 24/7 CCTV monitoring, in-house restaurant and fitness centre. They are well connected to the railway station and the airport. This centre is ideal for companies with international clients, and for those seeking a comfortable yet impressive working environment in a modern building. There is meeting room access, conference facilities, AV equipment, and administrative/IT support. 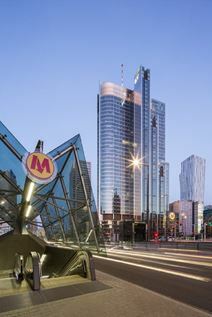 Centre your business in lively Mokotów, the second largest office district in Warsaw. These offices come with flexible terms with contracts as little as one-month and with all-inclusive pricing you pay one price for a fully-furnished office, including furniture, WiFi, phones, utility bills and a staffed reception. There is a communal kitchen area with tea and coffee making facilities and an office cleaner. 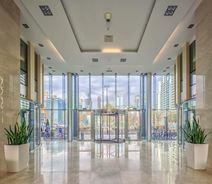 These office spaces benefit from a unique location in an eminent and renowned area of Warsaw, hosting major companies, banks and shopping centres. Served by public transport, and close to the city centre and to the airport, this area offers an ideal location for dynamic businesses. This centre, accessible 24/7, has parking on-site, conference facilities, a secretarial team with telephone answering services, and a security system. Designed to a high standard and decorated with great attention to details, this brand new business centre offers elegantly furnished offices. It is located in a renowned area of Warsaw, which hosts institutions, companies, theatres and numerous amenities and is located close to the railway station. This centre hosts a variety of shops, a large parking area and numerous facilities, which these offices can benefit from. These offices, opening soon are located in the heart of Warsaw and are easily accessible by both car and public transport. The centre is accessible 24 hours a day so is suitable for any kind of working hours and there is also meeting room access. Being located in the city centre means that all day-to-day amenities are found within walking distance. Whether you're grabbing something to take back to the office or sitting down to lunch and a business meeting with a client there is something to suit all needs. Set in an historical building, these recently renewed offices are sophisticatedly designed and furnished to a high standard. They are provided with advanced technology, air-conditioning and the latest IT infrastructure, while still retaining the original antique charm. The building is located in the city centre and is surrounded by banks, hotels, restaurants, numerous offices and the most famous amenities of the city. Close to the railway station and the airport, it is well served by public transport. A modern business centre situated in central Warsaw, providing furnished offices for affordable prices. Work-spaces here benefit from plenty of natural light, high-speed internet, meeting rooms and a professional reception service. Tenants can also benefit from business lounge access and virtual office options. The surrounding area is filled with local amenities and notable cultural attractions to enjoy such as the Museum of Natural History. Transport links are substantial as well, with great road, rail and air linkages. With fully furnished executive suites, this business centre is part of a newly-built Class-A office building next to the old town in a wealthy neighbourhood. The area is particularly popular with public bodies and law firms with which you can network. The space is accessible 24/7 and features round the clock security with on site parking and support services. The surrounding area has lots of attractions, museums and eateries to visit outside of work. 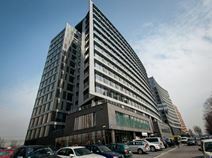 High standard office spaces are available to let within a modern and elegant building located in the heart of Warsaw. Sophisticatedly equipped, these offices are provided with a wide range of facilities and benefit from professional and friendly staff supporting your business with a variety of services. The building is within walking distance of the main railway station, surrounded by numerous amenities and is well served by public transport.